Clip-In – these come in various different types of styles ponytails, full head pieces, upstyles, volumizers to just name a few. These are great for occasional use although many women use these as a daily addition to their hair regime. They clip-in and out in minutes and can achieve some really great looking hair. 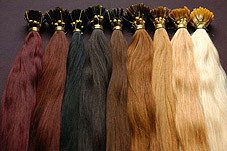 Keratin Fusion (strand by strand or prebonded) – ‘keratin’ is in fact a poylmer, plastic or glue based material which is used for heat sealing hair extensions on to the natural hair. It can be used with a glue gun or on prebonded hair extensions which are heat clamped into the hair. Cold Fusion – is very similar to Keratin fusion although it is applied with an ultrasonic clamp which does not use any heat. Weave – this is where natural hair is cornrowed then hair is attached on to the tracks by sewing. Tree Braids – hair is pinched braided with extension hair to extend at the same time.